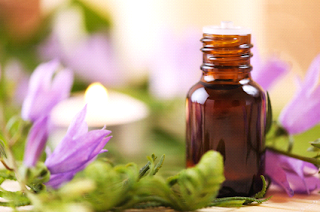 Aromatherapy is the use of essential oils from plants for healing. The oils can be inhaled, poured into the bath or applied topically to the skin using carrier oils. Essential oils are concentrated extracts taken from the roots, leaves, seeds, or blossoms of plants. Each contains its own variation of active ingredients. Oils should be diluted in carrier oils before application to the skin. There are some exceptions to this rule but in general you should always dilute the oils - seek advice from a qualified aromatherapist before experimenting with essential oils. Aromatherapy massage is a popular way of using essential oils because it works in several ways at the same time. Your skin absorbs essential oils and you also breathe them in. Plus, you experience the physical therapy of the massage itself. Massage therapy is based on the ability of the body to naturally heal itself – why not give it a try? All massage treatments are hands-on massage of light, medium or firm pressure, according to your personal requirements. Please note, however, that aromatherapy massage is not deep tissue massage. It is a more gentle approach but firm pressure can be used if you ask. Please let your therapist know your requirements and speak up during the massage if you need anything changed. Aromatherapy massage relieves muscle tension, stimulates circulation, increases serotonin levels, improves muscle tone and promotes total mind and body relaxation. Debi Barr is an independent consultant for Neal's Yard Organic Remedies and therefore uses natural, organic, pure essential oils and products in her aromatherapy and reflexology sessions. She offers aromatherapy back, neck & shoulder massage and Indian Head Massage from her treatment room in Bangor. Please note these services are currently not available - sorry for any inconvenience.